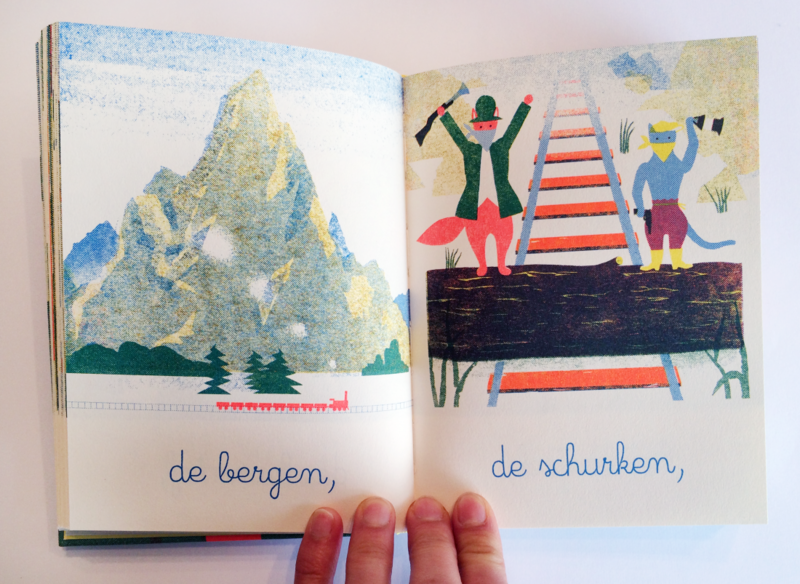 The book ‘Ballad’ (Een sprookje (nl)) by the French artist Blexbolex feels very compact and tactile in your hands. It is not large in terms of dimensions, but it certainly has volume. 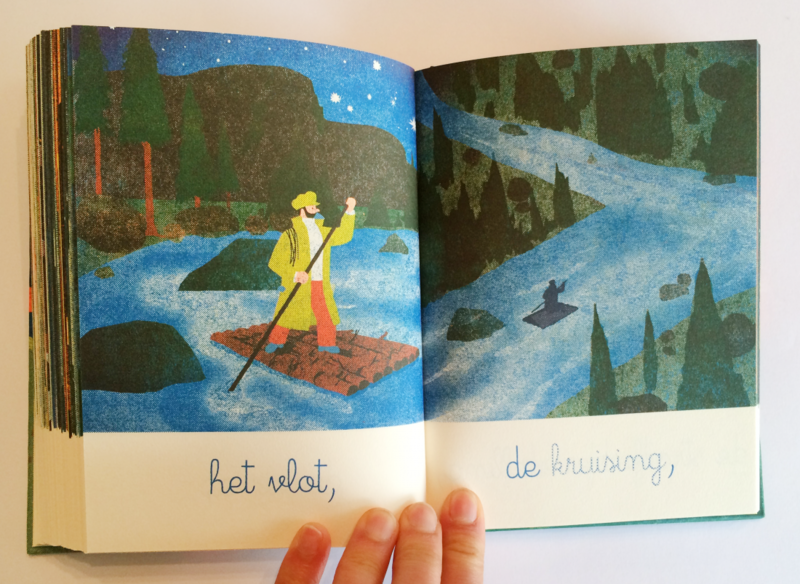 The book ‘Ballad’ (Een sprookje (nl)) by the French artist Blexbolex feels very compact and tactile in your hands. It is not large in terms of dimensions, but it certainly has volume. The paper of the cover is slightly embossed with ribs and is not laminated (fortunately). No layer of plastic between the reader and the paper. 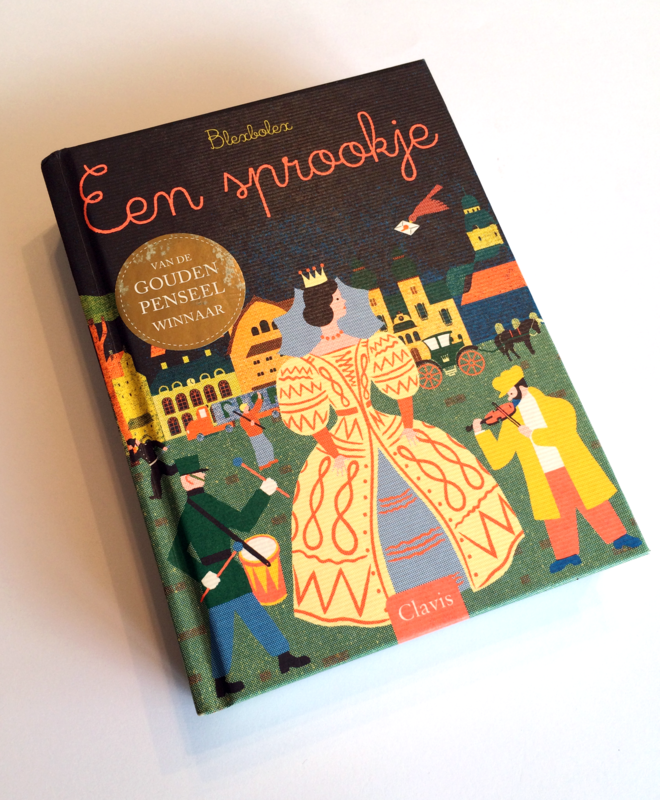 The cover is colorfully illustrated with various figures, such as a queen and a violin player against a backdrop of various facades. The exciting use of colors is formed by the combination of fluorescent coral pink with dark blue and dark green. 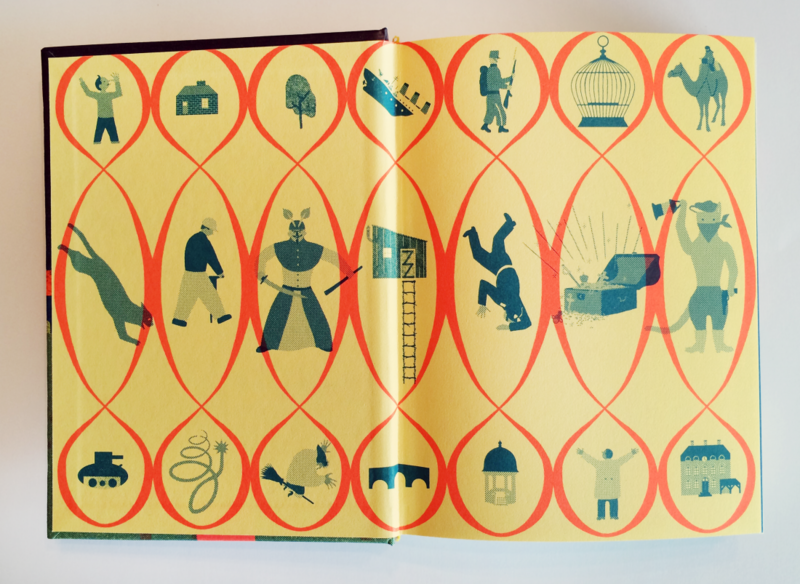 When you open the book, you will be struck by the graphic, rasterized illustrations on the cover pages in a pattern of – once again – the fluorescent pink shade on a yellow background. As if you’re in a movie, putting frame after frame to create a cinematic experience. The paper of the interior has a somewhat rougher surface, will tempt you to touch it, immersing you in the fairytale. A fairytale you – the reader – can compose yourself, using the various characters, backdrops and storylines. 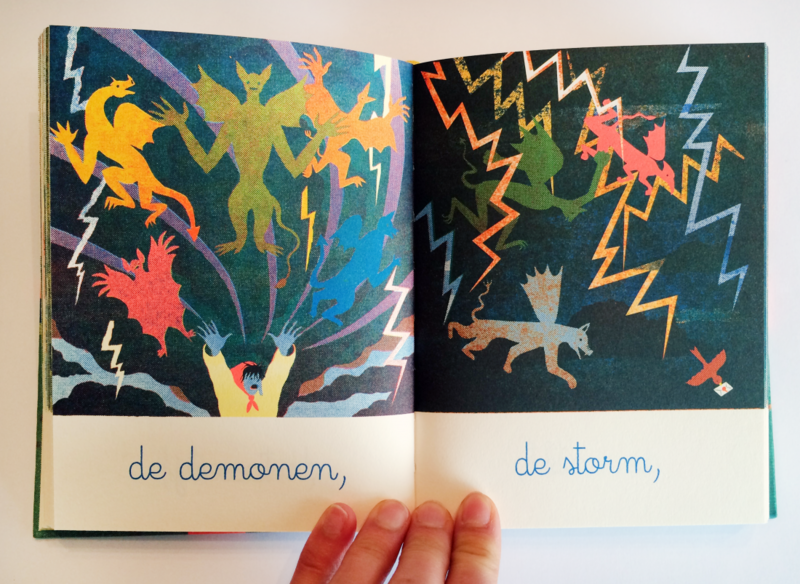 Throughout the book, you will find a powerful illustration on every page, with the same characteristic use of color as on the cover. 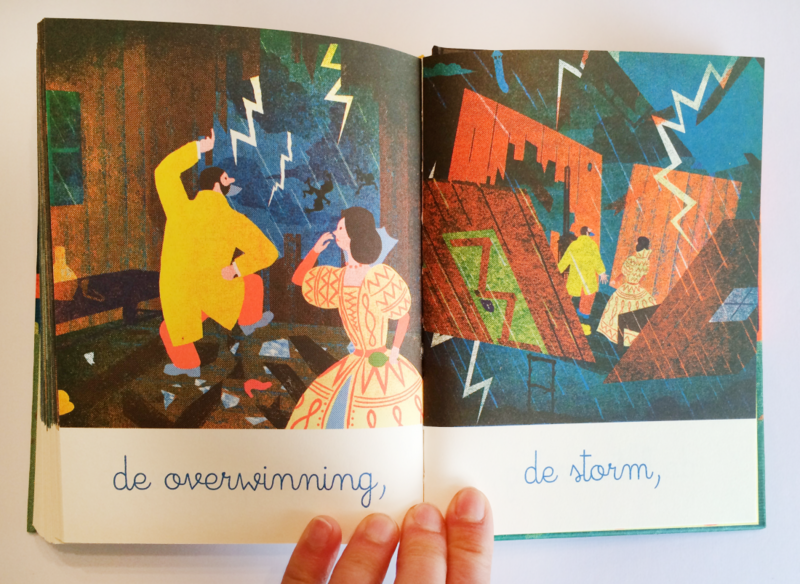 Underneath each drawing is a word, causing you to quickly advance to the next page. It is as if you’re in a movie, putting frame after frame to create the cinematic experience. The text has a typesetting in handwriting, making it friendly and mild. 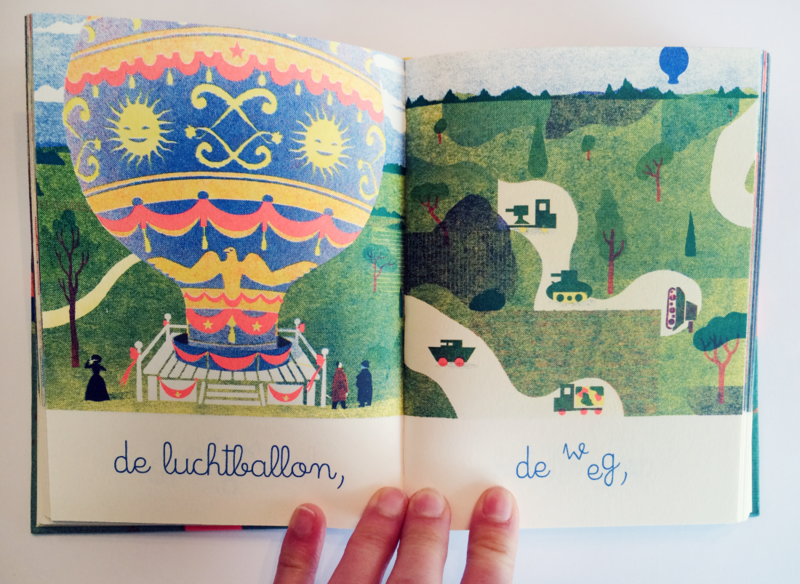 The rasterized illustrations are reminiscent of old-fashioned printing, giving you a sense of nostalgia. In summary, not just any book to simply store somewhere, but a book that you will pick up time after time to look at, feel, read and allow to take effect on you. Which book or story made an impression on you? And why? Please come over and tell me about it. Thanks! Blexbolex is a pen name for Bernard Granger. More information is available at Wikipedia. You can order the book at Bol.com or Amazon.